The new Food City Pharmacy online portal will allow you view information about your current prescriptions, find special offers and easily refill, or transfer prescription. Can I refill my prescription without creating an account? Yes, go to FoodCity.com and click on the Pharmacy tab at the left of the page. Click the Sign Up button at the bottom to be directed to the new portal. Once you are in the new portal click Refill by Rx Number at the bottom of the page and this will direct you to enter your prescription information. Can I transfer my prescription without creating an account? Yes, go to FoodCity.com and click on the Pharmacy tab at the left of the page. Click the Sign Up button at the bottom to be directed to the new portal. Once you are in the new portal click Transfer Rx at the bottom of the page and this will direct you to enter your prescription information. To create an account Go to FoodCity.com. Click on the Pharmacy tab at the left of the page. Click the Sign Up button at the bottom to be directed to the new portal. Once in the portal, Click Sign up at the top right. Follow the instruction to create your account. How do I access my patient information? To access your patient information you must first create an account. Once your account has been created you will be able to refill or transfer prescriptions by entering the Rx number. We value your privacy and security so you will be asked to provide patient Name, DOB, and a recent RX number for verification order to view your current prescriptions. A confirmation PIN request will be sent via phone call or text to the phone number on file with the pharmacy. 4. Enter the provided PIN for access to your current prescriptions. What if I never receive my confirmation PIN? Contact your local pharmacy for assistance. We may need to update your information. To add multiply members to your account simply log into your account, click Prescription at the bottom. Click Add Family Member and following the steps for each member. Can I set up an online account if I don’t have a prescription number? Yes, you can but you will be limited to just refill and/or transferring your prescriptions by providing the Rx number. You will not have access to current informations until we can verify your account. Can I use the same email I share with a family member to create my own account? No, once an email has been used to create an account, it may not be used again. What if I don’t remember my password? When you are directed to the portal, click the Sign In at the top. Once the sign in page opens you will be provided a link to click for password recovery. A confirmation request will be sent via phone call or text to the phone number on file with the pharmacy. Can I opt into Auto Refills through the portal? Yes, when processing a refill request you will be asked if you would like to be enrolled in Auto Refill. When opting into Auto Refills, if eligible, we will refill your prescription when it becomes due. If you have opted in for refill notifications we will contact you when the prescription refill is complete. Can I opt into text Refill Notifications through the portal? No, but you can simply contact your local pharmacy and request text message notifications when your prescriptions are ready. Can I print my prescription history? Yes, once you have logged into your account, click the family members name you which to print history on. Next click the History tab in the center of the page. Your prescription history will display. Click the Print icon to the right of the page. You will be prompted to enter a date range then click Create to print the PDF version of your prescription history. 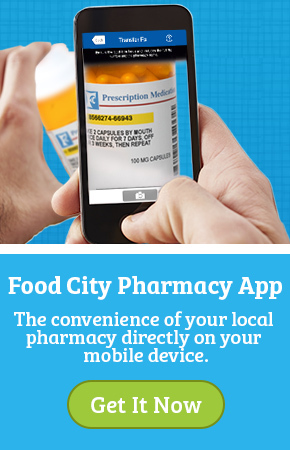 You can also download our Mobile App to refill or transfer your prescription, ask your pharmacist for details.